This amazing little tool has been a god send in my classroom. This creative organizer is interactive. Simply attach the front (Bed) sheet to the back (tracking sheet), then cut along the dotted lines. Students keep the sheet with them while reading. 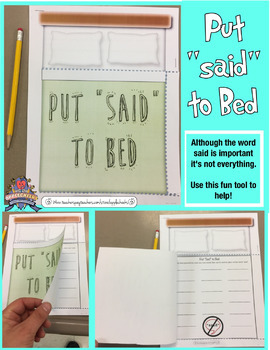 The sheet is used to keep track of creative ways to use dialogue while staying away from overusing the word "said". The students will love this and their writing will show it!